Between 1802 and 1804, under the reign of Napoleon I, a nine-arch metallic bridge for pedestrians was constructed at the location of the present day Pont des Arts: this was the first metal bridge in Paris. The engineers Louis-Alexandre de Cessart and Jacques Dillon initially conceived of a bridge which would resemble a suspended garden, with trees, banks of flowers, and benches. Passage across the bridge at that time cost one sou. On 17 March 1975, the French Ministry of Culture listed the Pont des Arts as a national historic monument. In 1976, the Inspector of Bridges and Causeways (Ponts et Chaussées) reported several deficiencies on the bridge. More specifically, he noted the damage that had been caused by two aerial bombardments sustained during World War I and World War II and the harm done from the multiple collisions caused by boats. The bridge would be closed to circulation in 1977 and, in 1979, suffered a 60-metre collapse after a barge rammed into it. The present bridge was built between 1981 and 1984 „identically“ according to the plans of Louis Arretche, who had decided to reduce the number of arches from nine to seven, allowing the look of the old bridge to be preserved while realigning the new structure with the Pont Neuf. On 27 June 1984, the newly reconstructed bridge was inaugurated by Jacques Chirac, then the mayor of Paris. The bridge has sometimes served as a place for art exhibitions, and is today a studio en plein air for painters, artists and photographers who are drawn to its unique point of view. The Pont des Arts is also frequently a spot for picnics during the summer. The Argentinian writer, Julio Cortázar, talks about this bridge in his book „Rayuela“. When Horacio Oliveira goes with the pythia and this tells him that the bridge for La Maga is the „Ponts des Arts“. In 1991, UNESCO listed the entire Parisian riverfront, from the Eiffel Tower to the end of the Ile Saint Louis, as a World Heritage Site. 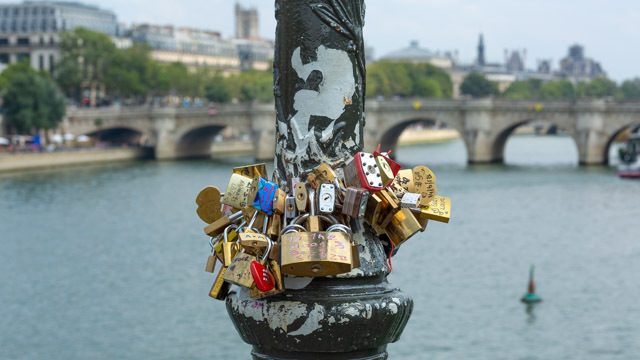 Therefore, the Pont des Arts is now a part of this UNESCO World Heritage Site.